Robert Burns was Scotland's greatest poet and many would say that he was the world's greatest ever poet. Burns was born at Alloway, Ayrshire, Scotland on 25 January 1759 and died in Dumfries on 21 July 1796. In less than 37 years of life he accomplished more than most people do in a normal lifetime. The son of a farmer, Burns was the oldest of seven children, all of whom had to help in the work on the farm. Although never well off, Burns' father, until his death in 1784, encouraged his sons with their education. As a result, Burns as a boy not only read Scottish poetry but also the works of Pope, Locke, and Shakespeare. By 1781, Burns had tried his hand at several agricultural jobs without success. Although he had begun writing, and his poems were circulated widely in manuscript, none were published until 1786. At this time he had already begun a life of dissipation, and he was not only discouraged but poor and was involved simultaneously with several women. Burns decided to marry Mary Campbell and migrate to Jamaica. To help finance the journey, he published at Kilmarnock Poems (1786), which was an immediate success. Mary Campbell died before she and Burns could marry and Burns changed his mind about migration. He toured the Highlands, brought out a second edition of his poems at Edinburgh in 1787, and for two winters was socially prominent in the Scottish capital city. In 1788 he married Jean Armour, who had borne him four children and retired to a farm at Ellisland. By 1791 Burns had failed as a farmer and he moved to nearby Dumfries, where he held a position as an excise man. He died at 37 after a severe attack of rheumatic fever. Burns’s art is at its best in songs such as Flow Gently, Sweet Afton, My Heart’s in the Highlands, and John Anderson My Jo. Some of his work, such as Auld Lang Syne is among the most familiar and best-loved songs and poems in the English language. But his talent was not confined to song; two descriptive pieces, Tam o’ Shanter (reproduced in full below) and The Jolly Beggars, are among his masterpieces. 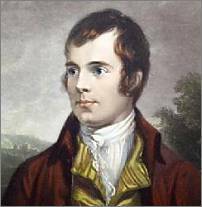 Burns had a fantastic sense of humour which was reflected in his satirical, descriptive, and naughty verse. His great popularity with the Scots lies in his ability to depict with loving accuracy the life of his fellow rural Scots, as he did in The Cotter’s Saturday Night. His use of dialect brought a stimulating, much-needed freshness and raciness into British poetry but Burns’s greatness extends beyond the limits of dialect. His poems are written about Scots, but, in tune with the rising humanitarianism of his day, they apply to a multitude of universal problems. Socialists, communists, atheists and anarchists all claim that Robert Burns was one of their founding fathers. In commemoration of Roberts Burns, Burns Suppers are held throughout the world on, or about, his birthday on 25th January. Burns Suppers normally highlight a major speech and toast to the Immortal Memory with other toasts to The Lassies and The Guests. The haggis is piped in by a piper and split open to the words of the immortal poem To a Haggis. For honest men and bonie lasses). Where Mungo's mither hang'd hersel'. Each in its cauld hand held a light. A knife, a father's throat had mangled. And linkit at it in her sark! A' plump and strapping in their teens! Louping an' flinging on a crummock. I wonder did na turn thy stomach. And scarcely had he Maggie rallied. Wi' mony an eldritch skreich and hollow. In hell, they'll roast thee like a herrin! In vain thy Kate awaits thy comin! But little wist she Maggie's mettle! Contemporary woodcut showing Tam wearing his bonnet and sitting astride his horse Meg.